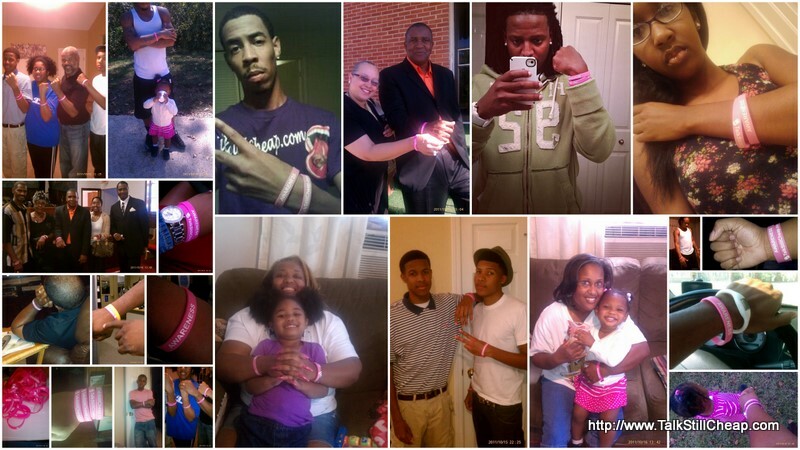 PINK pics : Thanks for your Support!! I would like to personally thank everyone who made a contribution during the month of October for my Breast Cancer Awareness initiative. I am very pleased with the amount of participation. I got my shipment of AWARENESS wrist bands on October 11th, and in just 3 weeks supporters of TalkStillCheap.com donated right at $400. Everyone who made a donation received a wrist band for every $5 donated. Participants ranged from family, friends, church members, readers, and friends and family of those who wore their bands from day to day. The above photo is just a glimpse of some of the donors. For just 3 weeks, I think the amount was pretty good. However, the search for a cure does not end in October. You can continue to donate and receive a free wrist band at any time. Visit this site and click the donate button and yours will be on its way. On behalf of all my supporters and participants, I decided to make a donation to The Breast Cancer Research Foundation. I decided to also use this opportunity to introduce a foundation that most may not be familiar with. Susan G. Komen does a great job bringing awareness, via "race for the cure", to communities throughout the United States. However, The Breast Cancer Research Foundation is one of the top rated non-profit national organizations for Breast Cancer Awareness and Research. About 90% of donations received by the foundation goes towards research grants and awareness programs. Not only does the foundation conduct continued research to find a cure, it also provides services to prevent Breast Cancer. The foundation was founded by a breast cancer survivor. The site also offers services to help you set up your own fundraising efforts. You can visit their site for more information, as well as make your own donation for the cause. Again, I would like to say thank you. "Many hands make a heavy burden light." I hope you feel just as great as I do about the great strives we made during the month of October. Big Shoutout to my GUYS. I had more men to donate than women. Several of my male donors made donations big enough to receive several wristbands that they in turned gave away to others. Not to start a war, but the men really stepped up, and as you can see in the above pic, they were not afraid to wear PINK. Ladies, don't they all look great? Please share any stories you have about the bands in a comment on this post. Also, feel free to share any ideas you may have for making an impact this holiday season. I am thinking of something ... I will definitely let you know what. Stay POSTED! !